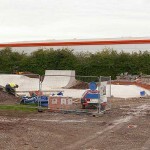 The opening of the long awaited Bridgwater Skatepark at it’s canalside location in the Westover ward. 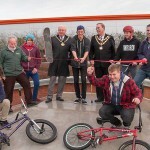 The new Bridgwater Skatepark at Friarn Avenue in the Westover ward, was officially opened on Saturday 14th December 2013. 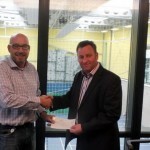 The park was opened by skate park users, staff from the YMCA, Sedgemoor District Council Chairman, Councillor Peter Downing and Bridgwater Mayor, Councillor Dave Loveridge. The skatepark includes ramps, a bowl, rails and even has a centrepiece carrying the names of the local young people who formed a user-group and invested a great deal of time and effort into the project. The opening finally saw, after a long campaign. the user-group and other young people enjoy the facilities for the first time. The YMCA, and Sedgemoor, had always planned, after this more formal event, that in the early spring of this year, a skate-jam would be held. This will take place on Saturday 12th April between 12noon and 4:00pm and is being run by Crucial BMX. The event will be free and is open to all BMXer’s, Skaters and Scooter users to come along and join in- as well as spectators.